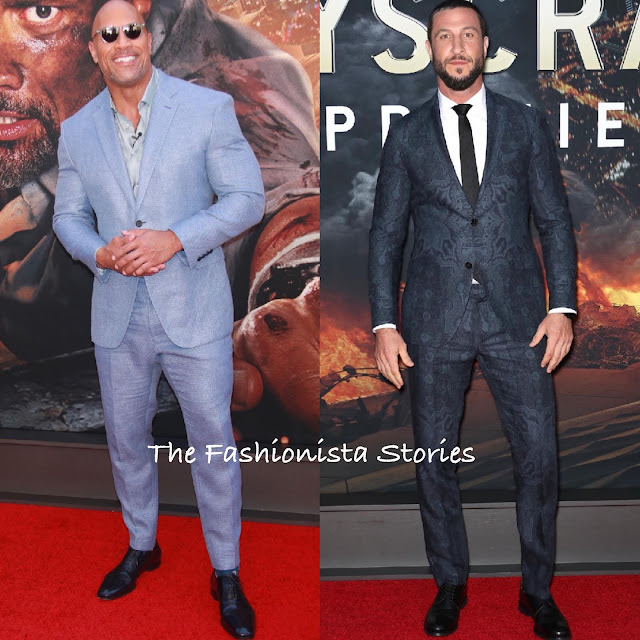 Along with the ladies, Dwayne Johnson and Pablo Schreiber hit the red carpet for the 'Skyscraper' premiere at the AMC Loews Lincoln Square theater yesterday evening(July 10th) in New York. Dwayne Johnson stepped out in a custom BRIONI light blue, two-piece suit which he accessorized with STATE OPTICAL CO. shades, an IWC watch, TIFFANY & CO jewelry and CHRISTIAN LOUBOUTIN shoes. Ignoring the creases, I do like this color on him. Pablo Schreiber wore an paisley ETRO suit which he teamed with a white button down shirt, a a tie from THE TIE BAR, a MOVADO watch and GRENSON shoes. Despite the dark color, I am glad that he gave us something interesting because I love this paisley suit. Too bad about the fit.